Please check back frequently as new questions/answers will be posted as issues arise. Click on the questions below to see answers. How much funding did AKSSF receive for this call for proposals? We do not yet know how much funding AKSSF will receive for this call for proposals. If additional information is available before the call closes, this answer will be updated. Where are current federal grant regulations/What is 2 CFR 200? Federal grant regulations changed significantly for federal awards made on or after December 26, 2014. All successful applicants of this CFP will be required to follow these regulations, consolidated at 2 CFR 200, for their proposed project. In the past, different entity types (e.g., non-profit, government, university) followed different federal grant regulations. With the 2 CFR 200, all types of entities will follow the same regulations (with the possible exception of subpart F, Audit Requirements, for commercial/for-profit subawardees) which include uniform administrative requirements, cost principals, and audit requirements. Your entity should be thoroughly familiar with these regulations. What are cooperators, principal investigators, and co-principal investigators? Cooperators are organizations that receive funding through the project, collaborate on the project, and perform a significant portion of the work; cooperators are subrecipients (see below). Contractors (also referred to as "vendors") are not cooperators. The principal investigator and co-principal investigator(s) share responsibility for the project. There can be multiple co-principal investigators, but only one principal investigator. Each organization in the proposal budget must be represented by at least one investigator. Organizations not funded by the project may also provide co-principal investigators. What is the difference between a cooperator/subrecipient and a contractor/vendor? For a culvert replacement project, you decide it will be more cost effective to have an outside company do the excavation work. You inquire with several businesses and they provide bids for the excavation work. You contract with an electrician to assist with wiring your batteries and power generators for a sonar project. You purchase radio tags or other project supplies/equipment from a business. You contract with a lab to analyze samples for you. A for-profit organization wants to partner with your organization on a fisheries project. They have expertise in habitat restoration projects and they have volunteers and equipment to help meet the match requirement. You plan to work with a university professor on a salmon genetics project. Your organization will collect the DNA samples and the university's lab will analyze the samples. You will collaborate on a report or paper. If we have doubts about a potential collaborator's financial or business management systems, can we avoid the issue by listing them as a contractor? No. Federal requirements require accurate designations of contractors/vendors and cooperators/subrecipients. Cooperators are required to fill out the Applicant Certification Form and Federal Grant Management Capabilities Survey (if applicable) and upload them to the proposal submission system by the closing date/time of the call for proposals. Failure to do so will disqualify the proposal entirely. The proposal submission system will not prompt you to upload those documents for a contractor. If you incorrectly classify the organization as a contractor (i.e., they fit the description of a cooperator/subrecipient but are included as a contractual/line 300 expense in a cooperator's budget) and the required documents are not uploaded, your proposal will be non-responsive. What if I incorrectly include an organization as a contractor when they are really a cooperator/subrecipient? Should all investigators on the project be entered on the proposal submission system, even if they do not receive funding? Yes. All investigators should be entered on the Investigators tab of the proposal submission system; the proposal submission system will ask which of the organizations you've entered (each of which is associated with an investigator) are proposed to receive funding and/or provide match. Where do I describe organizations partnering on the project that do not contribute investigators or match (I don't see a partners section in the proposal form)? You may upload letters of endorsement in the Optional Documents section of the proposal submission system from organizations partnering on and/or supporting the project. Please note that any organization named in your proposal as a collaborator or supporter that does not contribute an investigator will not be considered a supporter unless that support is substantiated by a letter. Is fiscal sponsorship, subawarding, or providing "pass-through" funding allowed? Subawarding any AKSSF funds to another entity is typically not allowable (i.e., competitively or non-competitively providing funds to another organization to perform a substantial, programmatic portion of the project). AKSSF will consider granting exceptions for federal agencies on a case-by-case basis when there are compelling reasons to do so. Fiscal sponsorship relationships are also not allowed (i.e., subrecipients must apply for and administer their own funds). Does a non-profit organization need to find a pass-through entity to be eligible to apply? No. In fact, subawarding, fiscal sponsorship, or providing "pass-through" funding is not allowed by AKSSF (see previous question). What is the purpose of the Federal Grant Management Capabilities Survey? As a primary recipient of federal grants, ADF&G has a fiduciary responsibility for ensuring that subrecipient organizations have the requisite financial and business management systems to ensure safeguarding of federal funds. Therefore, based on recommendations from a federal grants expert, ADF&G contracted an independent Certified Public Accountant (CPA) to develop a risk assessment system to evaluate applicants. This protocol evaluates Federal Grant Management Capabilities Surveys and associated documents to assess a variety of factors such as internal controls, policies and procedures, ability to absorb disallowed costs, audit experience, audit findings, personnel and training, and understanding of federal administrative requirements and cost principles. Based on these factors, the risk assessment system helps identify proposals from entities with high risk for managing federal funds. Subrecipient risk assessments are a requirement of current federal grant regulations at 2 CFR 200. I need help filling out the Federal Grant Management Capabilities Survey. Can you tell me how to answer questions X, Y, and Z? Unfortunately, AKSSF staff is unable to provide guidance (beyond simple clarifications) on how to complete this survey. The primary reason is that assistance could be construed as providing a competitive advantage to your organization. Furthermore, many of the survey answers require a thorough understanding of your organization's policies, procedures, and financial management systems. AKSSF contracted a federal grants expert to provide a technical assistance workshop in September 2011. This two day workshop provided guidance related to internal controls and business/financial management systems. Content from this workshop, including video and sample policies/procedures, is available at www.akssf.org/Workshop.aspx when logged into the AKSSF site. If you do not have login credentials and would like to view the materials, please contact Debbie Maas (debbie.maas@alaska.gov; 907-465-6134). Please note that grant regulations changed beginning with federal awards made on or after December 26, 2014. The workshop remains a good overview, but please review 2 CFR 200 for updated federal regulations relevant to all types of entities (with the exception of subpart F, Audit Requirements, for commercial/for-profit subawardees) in effect for all federal awards made on or after December 26, 2014. If you are unable to complete the form after reviewing the workshop materials, call for proposal materials, and 2 CFR 200, we suggest contacting a certified public accountant with an understanding of federal requirements. I submitted the Federal Grant Management Capabilities Survey with my AKSSF proposal last year; do I need fill it out again? Yes. The Federal Grant Management Capabilities Survey is required with each new call for proposals. Many factors affecting an applicant's score can change from year to year (e.g., staff turnover, federal funding amounts, financial status, grants training). The scoring system is also amended and refined each year. A passing score last year does not guarantee a passing score this year. I am interested in submitting a proposal jointly with another entity, but I am concerned their financial or business management systems may be deemed inadequate in the proposal review process (i.e., through the Federal Grant Management Capabilities Survey). What should I do? This is a legitimate concern as your entire proposal is jeopardized by the addition of an entity that may be judged as having insufficient business or financial management systems. If doubt exists as to the capabilities of another entity, you may want to consider partnering with a more capable entity. 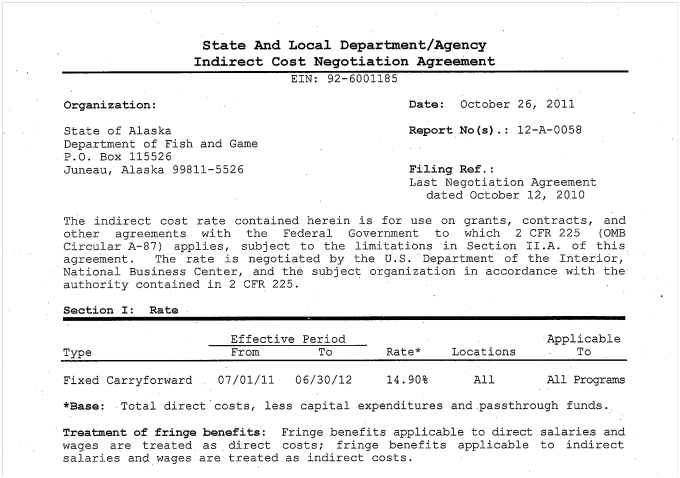 State of Alaska agencies are not required to fill out the Federal Grants Management Capabilities Survey. My organization is a quasi-state agency (or an entity that is authorized or otherwise affiliated with the State of Alaska); do I still need to fill out these forms? For the purpose of submitting an AKSSF proposal, State of Alaska entities do not need to complete these forms if they meet all of the following conditions: 1) they are staffed primarily with State of Alaska employees, 2) they are subject to the Alaska Administrative Manual, 3) they fall under the centralized administrative services of the Alaska Department of Administration, and 4) they are subject to audits by the Division of Legislative Audit. State of Alaska entities meeting these criteria are predetermined to have standardized financial and business management systems that are compliant with federal requirements. If your organization does not meet all of the criteria above, you are required to complete the survey and submit associated documentation in order for AKSSF to evaluate your unique financial and business management systems. Why is the system asking for my organization to upload indirect rate documentation when we do not have an indirect rate? On the Organizations tab, you select whether each organization associated with the project is proposed to received funding; if you answer yes, you will be asked to state whether that budget includes indirect costs. If you mistakenly answered yes, please go back to the Organizations tab and change the answer to no. This will remove the requirement to upload indirect documentation. Where do I enter what organization is applying for funding? All organizations proposed to receive funding must have an investigator associated with them. Fill out the investigator tab first, which requires you to add information about the organization for which each investigator works. Who should I enter as investigators? Each project must have a single principal investigator; one or more co-principal investigators may be added. Each entity proposed to receive funding must have at least one investigator associated with it. Additional investigators are optional. Why are certain documents required for some organizations and not for others? The type of documentation required depends on the type of organization, whether that organization is requesting funding and/or providing match, whether they have indirect costs in their budget, and other details derived from the information you enter into the proposal submission system. If you believe that one or more documents required on the Documents tab is incorrect, please double check the information you've entered, then contact AKSSF staff if the issue is not resolved. Will someone at AKSSF review my proposal to determine whether it is responsive before the deadline? AKSSF staff will perform a courtesy administrative pre-review of all proposals submitted through the proposal submission system by 12 noon Alaska Daylight Time on June 3rd. AKSSF staff will determine basic responsiveness to the requirements of the call as described in the "Responsiveness Criteria" section of the Call for Proposals Summary. Proposals submitted after this deadline are not eligible for administrative pre-review. AKSSF staff will contact the project investigators via the email(s) provided through the proposal submission system and either confirm basic responsiveness or list insufficiencies, usually the same day the proposal is submitted. Deficient proposals must be corrected and resubmitted on the proposal submission portal before the CFP deadline to be responsive to the CFP. The contents of the final submission will be the official documents/information used for the final review. The scope of administrative reviews is limited to the criteria outlined in the "Responsiveness Criteria” section in the Call for Proposals Summary; thus, AKSSF staff will NOT evaluate or provide suggestions to improve any other aspects such as: strengths and weaknesses of the proposal; grammar, spelling, punctuation, or mathematical errors; coherency, accuracy, completeness, clarity, or appropriateness of the proposal and budget documents; content of Federal Grant Management Capabilities Survey(s) and associated documents; or other qualitative characteristics. As you will have the opportunity to revise documents after the pre-review, we encourage you to utilize this service even if your proposal is not yet finalized. What if I miss the deadline for the administrative pre-review? Proposals submitted after the deadline are not eligible for administrative pre-review, but can still be submitted until the call for proposals closes. How long does it take to submit a proposal through the proposal submission system? When should I start the submission process? The time it takes to complete all information and upload documents on the proposal submission system varies depending on the proposal and the applicant(s) involved in the project. We strongly recommend that you start the process early (not the day that proposals are due) and allow yourself ample time to complete the submission. Power outages, slow Internet speeds, and other factors out of the control of AKSSF can affect your ability to submit proposals when left until the last minute. Late proposals will not be accepted. Is there a form to fill out for indirect documentation? If you have a federally negotiated indirect cost rate agreement (NICRA), the NICRA itself must be submitted (see next question). Federal agencies must submit a memo on agency letterhead (or comparable documentation) that provides its indirect rate. Entities requesting the 10% de minimis indirect rate must fill out the AKSSF 10% De Minimis Indirect Rate Form. What is a federally negotiated indirect cost rate agreement (NICRA)? I don’t have a NICRA. Can I still claim indirect? With the exception of governmental organizations that receive more that $35 million in direct federal funds, any nonfederal entity that has never received a negotiated indirect cost rate agreement (NICRA) may include a de minimis indirect rate of 10% of modified total direct costs (MTDC) in their budget. Costs incurred by the organization must be consistently charged as either indirect or direct costs, but may not be double charged or inconsistently charged as both. If used, this methodology once elected must be used consistently for all federal awards until such time as the entity chooses to negotiate for a rate. Applicants wishing to use the 10% rate must submit a signed AKSSF 10% De Minimis Indirect Rate Form as their indirect rate documentation to the proposal submission portal by the closing date/time of the CFP. MTDC include all direct salaries and wages, applicable fringe benefits, materials and supplies, services, travel, and subawards and subcontracts up to the first $25,000 of each subaward or subcontract (regardless of the period of performance of the subawards and subcontracts under the award). MTDC exclude equipment, capital expenditures, rental costs, tuition remission, scholarships and fellowships, participant support costs, and the portion of each subaward and subcontract in excess of $25,000. I see that the AKSSF Budget Spreadsheet only has one column. Does this mean funding is only available for one year? No, it only means that you should not split your budget by year. Funds are available for expenditure beginning no earlier than March 1, 2020, (unless justification for an earlier start date is provided in the proposal), and may be expended through November 30, 2022. Project expenditures, including match, may not occur prior to the project start date or after the project end date. Requested start dates are subject to change at AKSSF's discretion. Do we need to split expenses into fiscal years? / How should I organize my budget narrative? Although your project may span fiscal years, project expenses and match will not be split among fiscal years in the AKSSF Budget Spreadsheet and you should not split expenses into fiscal years in the budget narrative section of the statement of work and proposal forms. However, if the cost of an expense is expected to change during the project period (e.g., an employee's hourly rate of pay is scheduled to increase from $22 to $24 on January 1), you should list the number of hours and the rate of pay for each respective salary/wage period. The budget narrative should be concise, but with enough detail to be understandable to a layperson. For the sake of making these easy to read for reviewers as well as the general public, please keep your budget narratives as simple as possible (e.g., if pay rates are the same across fiscal years, please do not split expenses into fiscal years). If your organization wants your budget broken down into smaller periods (e.g., quarterly or by fiscal year), please provide this information to your supervisor or administrator separately from your proposal. A sample budget narrative for a fictitious project is provided below. If my proposal is approved, will ADF&G write the contracts for us? AKSSF subaward agreements will be written only for project cooperators. If an entity has contractual expenses in their budget, they are responsible for issuing and administering their own contracts (i.e., ADF&G will not write the contracts for you). What is a third party match contributor? A third party match contributor is an organization that does not contribute an investigator (funded or unfunded) to the project, but does provide match. Third party match contributors must fill out and upload the Third Party Match Contributor form on the proposal submission system by the closing date and time of the call for proposals or that match will not be accepted and the proposal could be non-responsive for insufficient match. If the match budget includes indirect costs, indirect documentation must also be uploaded or the indirect portion of the match will be disallowed, which could also result in insufficient overall match and a non-responsive proposal. What is the basis for AKSSF policies regarding match? AKSSF match guidance is intended to be consistent with statutory requirements, the PCSRF grant award, and federal regulations. If you notice any discrepancies between AKSSF policies and federal regulations, please contact AKSSF staff for additional guidance. In general, our goal is to ensure that AKSSF match policies are compliant with, but not more restrictive than, federal requirements. Will I be scored higher if I include more than the required 35% of match in the match budget? No. You should include exactly 35% of requested funds in the match budget. The scoring criteria do not take into account additional match and investigators will need to remove any additional match from the budget tables and budget narratives of successful proposals. Please make sure that all required match documentation is uploaded (e.g., Third Party Match Contributor Forms, indirect documentation). If my organization plans to use volunteers as match, how do I show it in the match budget narrative? Do I need to submit third party match forms? Can I use unrecovered or underrecovered indirect as match? Yes. If approved by your organization/division, you can claim all or some of an approved indirect rate as match. Once listed in the statement of work as match, the match portion of the indirect rate may not be moved into the direct budget. Please see AKSSF invoicing policies and procedures for more information on how to claim indirect costs as match or contact AKSSF staff. Do I need to follow my organization's procurement process for vendor contracts identified in my proposal? Yes. All entities must follow their own procurement process (which must be in accordance with applicable federal requirements) for all contracts. Naming a vendor in a proposal does not overrule your procurement rules or automatically qualify them for funding. ADF&G investigators should consult with ADF&G procurement staff to determine if they can name vendors in their proposals or whether they must follow the procurement process. Suppose the field season for my project starts April 15; what should my start date be? All projects may submit proposals with start dates of March 1 or later. However, if a project has an early field season that requires preparatory work (e.g., training new employees, purchasing supplies), we recommend that ample time is included to make sure those expenses take place after the start date. If your project would benefit from a start date before March 1, include justification for an earlier start date in your proposal. Please note that AKSSF reserves the right to change requested start dates at its discretion. What is the timeline for proposal review? Once the CFP closes, all proposals will undergo a responsiveness review (see the Call For Proposals Summary document for more information on responsiveness criteria). This will include review of third party match and indirect documentation. AKSSF staff may contact you during this time with questions. Those proposals that pass the responsiveness review will then be reviewed by independent reviewers who provide scores and comments for use in determining preliminary awards. We hope to provide notice letters to all applicants by the end of December. Once preliminary awards are made, AKSSF staff will begin thoroughly reviewing the statements of work and will contact investigators with additional requirements, revised SOWs, etc. AKSSF strives to finalize all projects prior to their requested start dates. CFP documents often reference "salmon." Are projects related to steelhead also eligible? Yes. Projects benefiting steelhead trout are also eligible. For technical support, questions, or comments, please contact Debbie Maas at debbie.maas@alaska.gov.